A little brown bat with White-Nose Syndrome in Greeley Mine, Vermont in April 2009. Perhaps you have heard of White-Nose Syndrome (WNS), a new disease of bats caused by an infectious fungus, Geomyces destructans. Maybe you saw the TV documentaries showing a carpet of dead bats in a Vermont cave. WNS, a disease that attacks the skin of cave-hibernating bats (but not humans or other wildlife), was discovered in New York State in 2006, and it spread from there. Like many invasive species and wildlife diseases, this fungus probably was accidentally introduced, in this case probably from Europe, where it infects bats without killing them. WNS rapidly spread throughout the northeastern U.S., down the Appalachians, and into Canada, and it has killed at least 1 million bats of six species. In some cases, 75-100 percent of the populations have died. Missourians value bats and other wildlife. Your Conservation Department has been on the lookout for WNS since 2009 because six of the nine species vulnerable to WNS occur in Missouri caves and abandoned underground mines. With more than 6,500 known caves and millions of bats in caves, forests, cities and farms, Missouri could lose a lot of nature’s free benefits. WNS moved from West Virginia through Tennessee in February and March 2010. We found the first signs of Geomyces destructans fungus (Gd) in a Pike County cave in eastern Missouri, April 2010. One little brown bat was found with a possible fungus on its wing, but no WNS infection in its deep tissues. Gray bats and a northern long-eared bat were netted by researchers in Shannon County in May 2010 and proved to have Gd but no infection. The Department’s “White-Nose Syndrome Action Plan” went into effect in April 2010. Based on careful analysis, our WNS Committee and managers restricted access to Conservation Department caves. Access is permitted only if there is a “Restricted Access” sign posted at the entrance, or if a person has a special research permit. Other agencies announced their own cave closure rules. The Department and the U.S. Fish & Wildlife Service formed the “Missouri WNS Working Group” to bring together state and federal agencies, private landowners and show cave operators how to share information and formulate a statewide, cooperative plan. Agencies and landowners are free to formulate their own policies on cave access. Most state and federal caves are closed or restricted to protect bats and avoid the accidental spread of fungal spores on clothing and caving gear. Strict decontamination rules are required even of researchers and cavers who go into the caves for necessary work. New, scientifically designed steel cave gates are being constructed on a few important bat caves to protect against intruders while allowing bats to fly in and out. During the winter of 2010–2011, Tony Elliott, Shelly Colatskie, and I (the Department’s bat and cave biologists) completed bat surveillance of 29 key caves and mines. So far, so good—we have not found outbreaks of WNS and the bats looked well. We sampled six bats for testing at the National Wildlife Health Center in Madison, Wis. (one gray, two little browns, one tri-colored, and two northern bats). One tricolored and two northern bats were sent for testing by Missouri State University scientists. The results for all nine were negative both for WNS infection and presence of the Gd fungus. We re-checked the caves where the first evidence of Gd was found in spring 2010, but the bats looked well. We did air sampling for fungal spores in the sites with a Burkard air sampler, paid for by a private donor through the Missouri Conservation Heritage Foundation. Our preliminary examination of the microscope slides showed almost no spores of any kind, except one sample that had a Gd-like spore. So, we can breathe a temporary sigh of relief. Did the Gd fungus disappear in Missouri? I doubt that because we could only study 6 percent of the known bat caves, although they were important ones. Also, the disease moved into several new states, including western Tennessee and Kentucky by April 2011. Now WNS infections are only 55 miles from Missouri. People sometimes ask why decontamination is required to enter publicly owned caves. As a longstanding policy to help protect bats and the fragile and unique ecosystems found in caves, the Conservation Department and other agencies restrict access to many of their caves. Access to Conservation Department caves is permitted only if there is a “Restricted Access” sign posted at the entrance, or if a person has a special research permit. Disturbing bats in caves while they roost or hibernate could increase their stress and weaken their health. Cleaning all caving gear with bleach or certain quaternary ammonium disinfectants reduces the risk of infecting new caves and bats. The microscopic spores have been found on some caving gear that was experimentally exposed in a known infected site. Another experiment introduced healthy bats from Wisconsin to two infected mines in Vermont, which no longer had bats. The mines were carefully screened to prevent bat exchange with the outside. Most of the new bats contracted WNS and died, so infected sites can remain infectious for long periods. See fws.gov/WhiteNoseSyndrome and fort.usgs.gov/WNS for information on WNS and decontamination. In 2010, amphibian chytrid fungus, Batrachochytrium dendrobatidis, was found in eight of 12 caves checked by Department biologists in southern Missouri. Five of seven species of frogs and salamanders were infected. This disease has killed many amphibians worldwide, but this was the first report from caves anywhere. Chytrid and WNS in caves point to the need to practice “clean caving” and decontamination as a precaution against the spread of wildlife diseases. There is no cure for WNS yet, but researchers are studying medical treatments using known antifungal drugs. Two recent drug trials were unsuccessful. These tests must be done in a lab or controlled environment, not in a cave, because antifungal drugs can be toxic and no one wants to poison the cave environment and its many inhabitants. We are hopeful that a safe, contained treatment for the bats might be found through research, but it may be years before that happens. What should landowners do if they have a bat cave on their property? About 500 Missouri caves are known to have bats, but that number may be as high as 5,000. About three-fourths of our caves are privately owned. The Conservation Department welcomes opportunities to collaborate with private landowners on cave management. Landowners are recommended to require cave visitors to decontaminate their clothing, boots and gear before entering a Missouri cave if their gear has been in any other cave before. Visitors also should not enter bat caves between early October and early May, to avoid disturbance of hibernating bats. Summer caves for gray bats also should be avoided. We can assist cave owners in protecting caves by surveying bat use of caves, providing signs, responding to trespass or vandalism issues, and possibly helping someone construct a cave gate or other type of protection. We can also introduce you to responsible cavers who might map the cave and photograph it for you. Nine of the 15 species of bats in Missouri are vulnerable to WNS. WNS die-offs would severely restrict the ability of bats to consume night-flying insects, especially certain moths and beetles that are agricultural or forest pests. Bats eat a large variety of insects, including a few mosquitoes, some of which are public health pests, but there is little information on how much they control mosquitoes. A preliminary study in Missouri in 2010 looked at the role of gray bats in mosquito suppression. Recent scientific papers estimated that bats contribute $961 million value each year to Missouri agriculture through insect control. Bats also contribute to forestry, but by an unknown amount. Some of our bats have been declining for decades, but each species has a somewhat different diet of insects. Our gray bats, though still endangered, have increased at some important bat caves because of improved protection by the Department and our partners. We estimate that Missouri’s nearly 800,00 gray bats consume 540 tons of insects per year, equal to about 223 billion “bugs.” Bats also have great scientific, educational, and aesthetic value to the public. To learn more, see www.batcon.org. 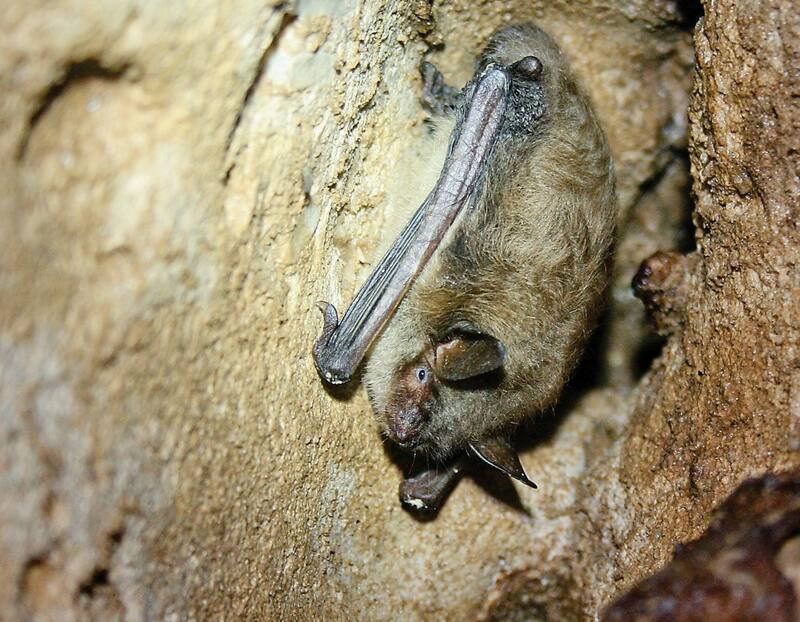 The Department has monitored cave bat populations for more than 30 years, traditionally by visually counting several species of hibernating bats and estimating summer gray bat colonies by measuring their guano deposits. In the past decade we added new digital photography and infrared videography methods to our tools. From 2008 - 2011 we visited 15 gray bat caves, including 14 maternity caves and one major hibernaculum (winter hibernating location), taking more than 50 thermal-infrared videos and five guano (bat droppings) estimates. The average summer colony was about 42,000 bats, and there were more than 311,000 at the largest hibernating colony. Gray bats have abandoned many caves because of human disturbance and other factors, but their Missouri total is now generally stable or increasing. We know that there are mass migrations of grays in late summer from the Lake of the Ozarks area to Boone County and other counties. We are extending the thermal-infrared method to count bats in fall mating swarms or emerging from hibernation in the spring. Please do not handle bats if you see them. WNS is not related to rabies, but if you find a bat on the ground it has a chance of being sick from something, such as rabies, which can be transmitted to you via a bite. There is a small but real risk that a downed bat could be rabid, and rabies is fatal to humans and mammals. Dead bats do not transmit rabies, but it is difficult to tell when a bat is actually dead, so please do not pick them up barehanded. The public can help by reporting to the Department dead or dying bats on the ground or near caves in winter or spring, but we do not ask the public to go into caves or mines looking for bats. That can be very disturbing to the bats, especially when they are sick, hibernating or rearing young in summer. WNS is more likely to be found in late winter or early spring, and the bat would likely have a white, fuzzy fungal growth on the face, ears and wings, but not always. We receive many calls in summer about bats in attics and houses, but those are not WNS related. All MDC offices have a reporting form for public reports of suspect bats, especially near caves. We are prepared to take those reports and send someone out to investigate certain cases, and possibly sample the bat if it is alive or freshly dead, but we cannot use old carcasses. We are ready to accept good close-up photos of WNS-suspect bats. Calls about cave bats should go to Dr. Bill Elliott, 573-522-4115, ext 3194, Bill.Elliott@mdc.mo.gov and/or Shelly Colatskie, ext 3641, Shelly.Colatskie@mdc.mo.gov in the Resource Science Division, MDC Headquarters, PO BOX 180, Jefferson City, 65102. Calls about Indiana bats, forest and urban bats go to Resource Scientist Tony Elliott, Kirksville, 660-785-2424 ext 257, Anthony.Elliott@mdc.mo.gov. Little brown myotises hibernate in Ozark caves and mines. In spring females form nursery colonies and males live singly or in small colonies.